1. Bourjois Bronzing Primer- Finally a dupe for the Soleil tan de Chanel hits the highstreet and beauty fanatics everywhere can sculpt and blend this creamy bronzer to their cheekbones content. Please note- this doesn't actually make a good primer, instead apply it with a good contour brush after foundation. 2. Herbal Essences Bee Strong Range- Endorsed by Nicole Scherzy herself- queen of strong, shiny hair- this new range from Herbal Essences containing honey extract promises big things and seems to also deliver. In fact, the intensive masque seems so good it could rival blogger fave, TRESemme Platinum Strength. 3. Maybelline Seven Day Super Stay Nail Polish- I've included a picture of the shade 'mint for life' because it's my new nail obsession and hardly leaves my fingers, but the other shades are also gorgeous, super long lasting and easy to apply with a high shine gel effect finish. What beauty dreams are made of. 4. Nivea in shower body moisturiser- The perfect lazy girl product! It's a bit of a bizarre concept but you just use a shower gel as normal then apply this all over your bod. Leave for a bit, shower it off and BOOM: Super soft supple skin without the hassle. The end of chilly, time consuming moisturising as we know it. All of these amazing new releases are under ten pound! 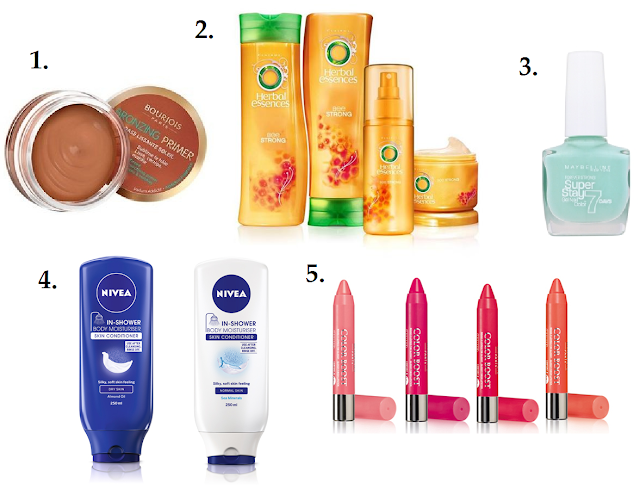 What's your latest drugstore find? Oooh I agree with 5, I am excited about those! I can't wait for the new Rimmel Apocolips shades to hit, they look amazing and I love the formula! Oh I've recently tried out the Herbal Essences Bee Strong Shampoo - and the scent isn't really fav' BUT my hair are more softer, shiny and lovely:)! Really a great drugstore shampoo! But the NIVEA In-Shower Body Lotion isn't the "Holy Beauty Product" ever! - The skin is softer after applying BUT I'm not really a fan of "Wash-off your lotion promptly"! I really want to try the Nivea in shower moisturiser, it sounds a lot like the Lush Ro's argan body conditioner which is really expensive. The bourjois bronzing primer sounds amazing something I really want to give a go! but £10.00 for a tiny tub? Hmm I can ait till next month! I love every product you spoke about, really want to give those bourjois colour boost lip crayons ago! really really want to try the bronzing primer! i ummed and ahhed about the chanel one when i was at duty free for ages and am kicking myself for not getting it, hopefully this will bee a really good alternative!